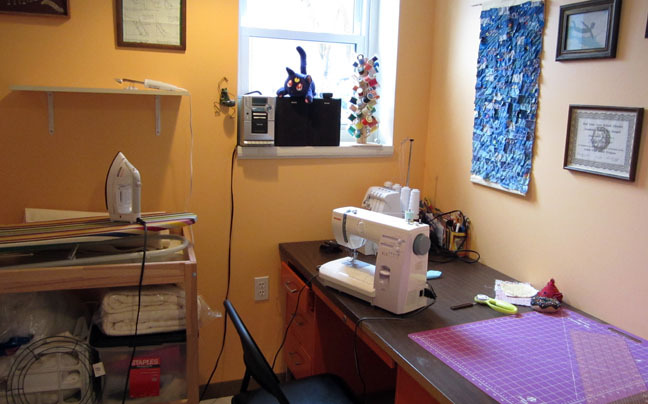 Blotch and Thrum: Sewing room! So, I've been working for three weeks on redoing the sewing room, something that has been on my to do list since at least January of last year! And now I'm pretty much done, apart from the ironing board and purchasing a new table. The view from the door. This is where I want a table for the machines. To your left is the fabric shelves and further to the left is a closet with more fabric storage. I had a picture, but it's not great. It's a closet. Once the machines are moved, this desk will be for cutting. The ironing station will have a top that is a piece of plywood covered by cotton and felt and canvas, to make a 2 foot by 3.5 foot ironing board. The shelf is iron storage. I'm pleased with the project so far, especially because I've been able to collect sewing supplies from all over into this tiny room, instead of having them strewn about the house. 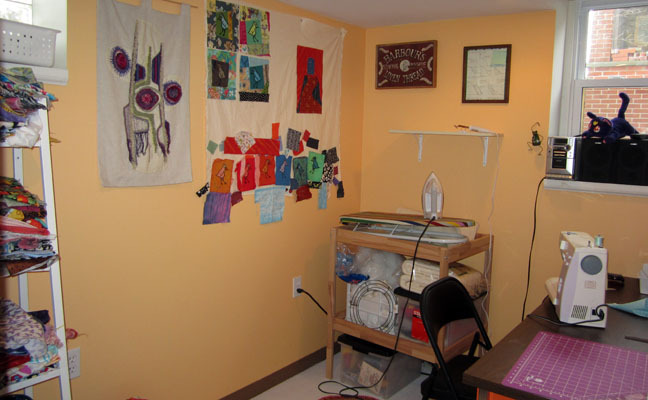 I used to just sew in here and do the ironing and cutting on the other side of the basement. Frankly, it would be more impressive had you seen what it looked like before... It was cream of mushroom soup color, and with teal carpet. It just goes to show that good things come out of small packages! Still, I long for more space. It's just right for now, though. Your space is lovely! Thank you for sharing your space with us on The Studio Spotlight Tour. Cream of mushroom soup color...now, that's a visual (and a horrid wall color) yours is so much prettier. Yes! We still have many walls that color. One day we will get to all of them... I hope. Crafts of the Past: Things from the box!